The baby is sleeping well today so I thought I would give another challenge a go. The blue on the card has a really nice pearly finish to it which doesn't really show up in the photo. 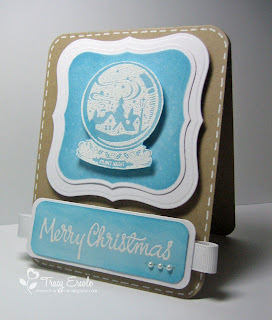 Simons Says Stamp has a challenge running which is Christmas in August so I thought I would give it a try. I will also put it in the AUD Sentiments Challenge #34 which is to have Merry Christmas somewhere on your card. Beautiful card Tracy, so elegant. Beautiful! love the faux stitching. What a beautiful Christmas card. I love the snow globe. Thanks for joining us at Aud Sentiments. Gorgeous creation, love the image. Thanks for playing at Aud Sentiments.